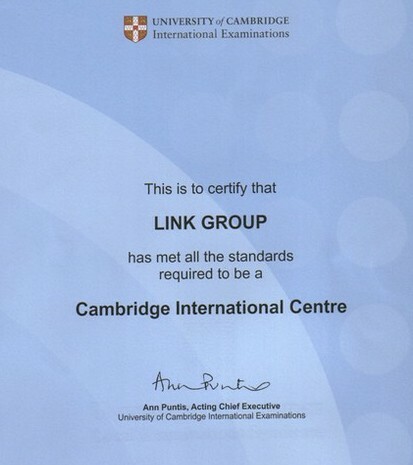 Link group has been awarded International Centre status by University of Cambridge International Examinations (CIE), one of the world's leading assessment providers. Link group will now teach and examine a range of internationally accepted qualifications including CIE's Cambidge International Diplomas. Tom Eason, CIE Director for Regional Development said: "We are delighted to announce that Link group has become a registered Centre and look forward to a long and productive relationship which will be of great benefit to students throughout the region." As a Cambridge Centre, Link group will offer students in Romania internationally renowned qualifications that are recognized by educational institutions and employers across the globe. Link group is proud to be associated with CIE as it enables them to extend their service and offer quality education to the local community. Traducerea textului o puteţi citi aici. Cât este de apreciată şi unde este recunoscută diploma Cambridge, citiţi în articolul publicat pe site-ul oficial al University of Cambridge International Examinations.